Major global museum exhibition tour debuts in London featuring many previously unseen artefacts in the centenary of Mandela’s birth. The only exhibition to be presented in collaboration with The Royal House of Mandela. Lawyer. Revolutionary. Political prisoner. World leader. Elder statesman. Symbol of the struggle against oppression. Nelson Mandela has been all these things to so many people across the world in the past 50 years and five years after his passing, he continues to remain a human rights icon and to be seen globally as an advocate for change. Now a major new exhibition, Nelson Mandela: The Official Exhibition, celebrating his life and legacy. These items, including the suit worn for the opening of the South African parliament in 1996; a traditional head dress gifted to him by The King of Xhosa people, King Xolilzwe Sigcawu as he awarded Mandela the ancient tribal warrior honour of the Isithwalandwe Sesizwe, for the ﬁrst time in two centuries. Also featured is his presidential desk and chair and his much loved iconic beige trench coat, combine with immersive media presentations and scenic re-creations, to enable visitors to actively engage with and experience key moments in Nelson Mandela’s life. Nelson Mandela: The Official Exhibition reveals his epic story in a series of experiential zones and forms part of the Centenary celebrations of Mandela’s birth and marks five years since his passing. The zones include The Early Years, Struggle is My Life, Prison Years, Freedom and Healing a Nation sections. Each featuring artefacts from intervals in his long and fruitful life. It succeeds in quintessentially depicting the man and the legend whose struggle and sacrifice has captivated the hearts and minds of millions around the world. This exhibition is truly an inspiration and an inspired effort; I believe that everyone who sees it will agree that the legacy lives on and that the dream will never die. London and the United Kingdom more broadly was home to many South African exiles and activists in the anti-apartheid struggle. In the 1980s and ‘90s Trafalgar Square and South Africa House was the scene of many a picket and protest action. And this news found its way to Mandela in his cell, either in encoded messages, by word of mouth and in the latter years, via news clippings. It was therefore no surprise that Madiba chose London as one of the first cities outside Africa to visit as a free man after his 27-year incarceration. I can say without the slightest doubt that Madiba would have given his stamp of approval to staging this exhibition in London. Mandela Exhibition, From 8th February, 26 Leake Street. 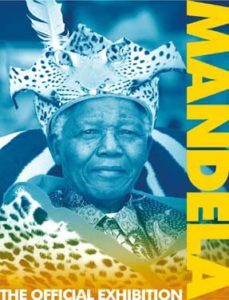 Visit: www.mandelaexhibition for ticket info and details.